A separate article points to the value a statewide HIE would bring to efforts to combat the opioid epidemic. Allan Hackey, head of the state’s latest HIE effort, says top priorities of exchange development include enabling providers to see in real time where a patient has sought treatment, including pharmacies and labs; plus medication reconciliation, which is already aggregated within the state’s PDMP. The HIE design team would like to embed PDMP access into the HIE for easier provider access. EHR and practice management vendor DrChrono upgrades its API for developers to include endpoints Clinical Quality Measures, clinical notes, tasks, billing, and labs, plus the FHIR interoperability standard. 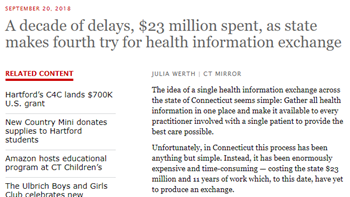 Consumer advocates band together under the X4Health brand to develop the Health Record Request Wizard. 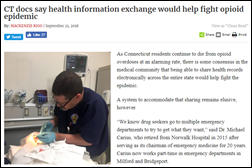 The smart form, according to advisor and CareJourney President Aneesh Chopra, acts as a records request “easy button,” giving patients a simple way to request digital records in the form and format of their choice. AppointmentNotify launches in New York City to offer providers a way to fill last-minute cancellations and unfilled appointments. Patients can use the startup’s portal to find open appointments, including those harder to come by new patient appointments, across the city. Founder and CEO Ali Nayyar told AlleyWatch that the technology is one step ahead of competitor ZocDoc, offering a more user-friendly interface. HIPAA Association of America opens for business to offer providers membership-based HIPAA compliance and cybersecurity services, including risk assessments, employee training, monitoring, and ongoing updates on policies and procedures. Relatient adds patient self-scheduling capabilities to its automated patient outreach software. Surgeon General Jerome Adams, MD releases a 40-page report on America’s opioid addiction crisis as part of the federal government’s continued efforts to raise awareness about proper prescribing practices and allocate funds for addiction programs and resources. The report emphasizes primary care’s role in laying the groundwork for screening and treatment, as well as the effectiveness of PDMPs in helping prescribers identify patients with a history of doctor-shopping. NxGen MDx adds virtual consults from Answer Health on Demand to its reproductive health-focused genetic screening and counseling services for women. Researchers look at the impact newly installed EHRs have on labor costs and physician productivity at two outpatient joint replacement clinics. The study found that labor costs spiked two months after implementation due to new documentation workflows, but stabilized to pre-install levels around the six-month mark. Time spent on documentation, however, did not stabilize; increasing to the point that physician interaction with patients decreased by nearly four minutes per encounter. In Colorado, 14 year-old Olivia Goodreau joins a tech development program sponsored by the Dept. of Health and Human Services to optimize the TickTracker app she created and launched in February. Goodreau contracted Lyme disease in first grade and went on to found the LivLyme Foundation in an effort to raise awareness about diagnosis and treatment. 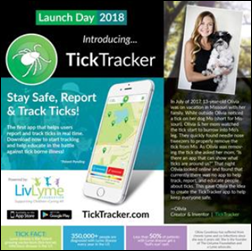 The app, which has spawned a company of the same name, gives users the ability to share pictures and locations of tick sightings that are then aggregated into a database that Goodreau and Chief Insect Information Officer Jeff Stafford hope will help researchers better understand tick populations and, ultimately, aid in finding a cure for tick-borne diseases. Intelligent Medical Objects will exhibit at AHIMA September 22-26 in Miami. Madison Magazine includes Nordic on its list of best places to work for the third straight year.